Have bare spots in your grass? With Grotrax, you just roll, water, and watch it grow! * Bio Fabric Prevents Seeds from Washing Away * Cheaper, Easier, and Lighter than Traditional Sod * Bio Fabric Holds 6x Times its Weight in Water * Turf Quality Lawn in Weeks with No Mess * Perfect for Sun, Shade and Slopes * Nonperishable, Lightweight, Easy to Transport! * Each roll contains 50 square feet of Grotrax. 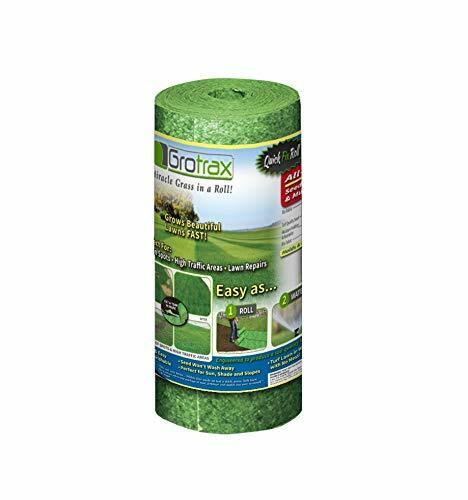 Grotrax Patch n Repair features the "Year-Round Green Mixture", which includes tall, fine and chewing fescue grasses, together with a unique combination of perennial rye and Kentucky blue. This combination ensures success in a wide variety of situations. Whether shaded or sunny, warm or cold, our high quality, concentrated year-round green mixture quickly germinates to create an attractive turf with excellent color, density and wear tolerance. It fights weed invasion and is disease resistant. It is an excellent all-round choice! Grotrax won the "Best in Class Gold Award" at the 2018 National Hardware Show!